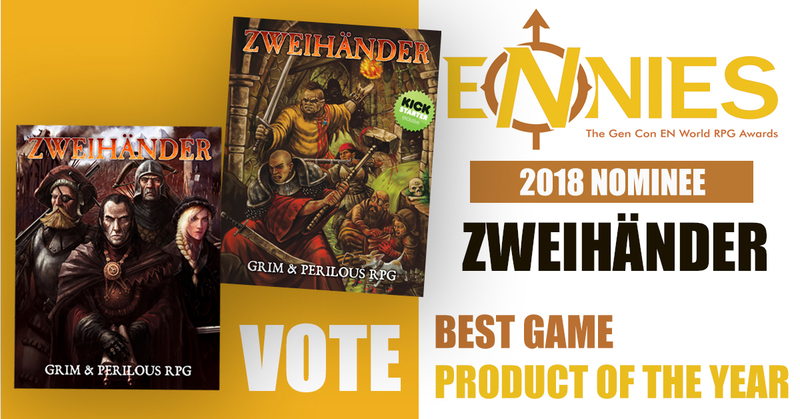 Vote Zweihänder for “Best Game” and “Product of the Year” in the ENnie Awards! The ENnies are here, and it’s time to vote! A number of smaller, DIY and OSR RPGs are in the top running this year. There are many amazing games and supplements across all categories. These awards are important, as it turns into industry recognition and sales, which means a lot to small publishers. Zweihänder has been nominated for BEST GAME and PRODUCT OF THE YEAR. We hope you’ll also write in “Grim And Perilous Studios” as FAN FAVORITE PUBLISHER. Even if you don’t vote for Zweihänder, please vote for your favorites. LotFP’s Frostbitten and Mutilated, LotFP’s Vaginas are Magic, Red Markets, The Midderlands, Dark of Hot Springs Island, Harlem Unbound: there are a ton of amazing RPGs in the running this year. Don’t vote for the big guys – give your votes to us little publishers, so we can one day grow as big as other titans of the industry.